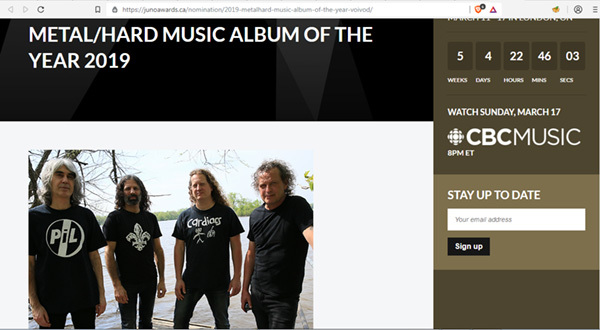 VOIVOD, CANCER BATS and KOBRA AND THE LOTUS are among the nominees in the “Metal/Hard Music Album Of The Year” category at this year’s Juno Awards (the Canadian equivalent of the Grammy Awards), set to be held on on March 17 at the Budweiser Gardens in London, Ontario, Canada. It was announced this morning that Sarah McLachlan will host the show, which will be broadcast live on CBC. Artists who released albums between September 1, 2017 and November 9, 2018 were eligible for nominations. 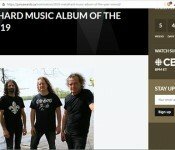 This is Voivod’s 3rd Juno nomination- Nothingface 1991 and Angel Rat 1993 were also nominated. The award show is March 17 in London Ontario at Budweiser Gardens. In 2018, Voivod’s 14th studio album, The Wake steers the Voivod spacecraft through a tangled, tantalizing storyline, woven into the most maze-like, edge-of-your-seat musical experience the band have embarked upon since those heady days of the late ‘80s. Songs such as “The End of Dormancy,” “Iconspiracy” and “Spherical Perspective” churn and twist in such a way that no Voivod devotee could possibly have wished for more. While previous album Target Earth was a grand rebirth for the band, and 2016’s Post Society EP a promise of adventurous things to come, The Wake takes the approach of those recordings, widens the parameters, and introduces a few bold new facets to the Voivod soundscape: prominent acoustic guitars and classic music flourishes are woven into the controlled electric calamity. The Wake is sure to be hailed alongside previous achievements Dimension Hatröss, Nothingface and The Outer Limits.